We have all visited at least one of the National Botanical Gardens in South Africa, yet a lot of us don’t know why exactly these areas are preserved or why so much effort has been put into their conservation. In South Africa, we have an astounding 9 National Botanical Gardens, these gardens are scattered across the country and serve as both a tourist attraction and information centres. They are closely involved with the South African National Biodiversity Institute (SANBI). You could call this the heart of conservation of flora and fauna in South Africa. The SANBI uses available sciences to determine how the biodiversity of the ecosystem and species are currently doing in South Africa. This is essential in conservation and sustainability within our natural habitat. The SANBI holds many meetings and talks all over South Africa which are compiled into the Synthesis Report that is available to the public. The aim of this report is to determine the critical endangered ecosystems and the best way forward with the conservation of our precious flora and fauna both on land and offshore. Situated on the Eastern slopes of Table Mountain, Kirstenbosch was established in 1913 to promote, conserve and display the extraordinarily rich and diverse flora of southern Africa. It was the first botanic garden in the world to be devoted to a country's indigenous flora. There are over 7 000 species in cultivation at Kirstenbosch, including many rare and threatened species. The garden spans for 36 hectares and seamlessly transitions into the 528 hectares of the Table Mountain National Park which is also a protected area for flora and fauna. A wide range of wildlife can often be spotted in the gardens as they may come and go as they please. Often playing host to many outside events Kirstenbosch boasts a variety of eateries and boutique stores. Take a look at our other guides to Nature Reserves and Game Parks in the Western Cape. Formerly known as Glenlyon, The Hantam National Botanical Gardens is situated in the Northern Cape. These gardens have 2 distinct visiting seasons, each offering a different and unique experience. The most popular of the two would be the flowering season that coincides with the Namaqualand blooms. The gardens stretch over 6000 hectares with nine different trails that can be followed, covering a variety of habitats and soil types that make this garden so unique and different. There are over 80 endemic (meaning they are indigenous to a certain area) species of flora and fauna that can be found in this area. The garden is home to a large natural selection of birdlife and works hard to preserve these fragile creatures. Visitors often spot various mammals going about their business in the gardens and the Butterfly Walk is a favourite among locals and tourists alike. Free - from November through to July. The Harold Porter National Botanical Gardens lies between the two seaside towns of Betty’s Bay and Gordons Bay. This garden is a culmination of ocean and mountain trials with 10 hectares of cultivated fynbos area and a further 190 hectares of wild natural fynbos. The location between the ocean and mountainside provides for rich diversity in the fynbos. This area, so untouched by man, is teeming with natural wildlife and visitors have even spotted the elusive African leopard. Famously known for the cold mountain pools and waterfalls that can be found on almost every trial through the garden, this is a loved attraction that is only 100kms from Cape Town city centre. This garden is ideal for meandering through at your own pace, with plenty of signage making navigation easy while learning about the medicinal qualities the fynbos provides the Khoi-San tribes. Open 365 days a year and with a small entrance fee, the Harold Porter NBG can be visited all year round leaving you with a unique experience during each visit. If hiking is your thing, check out our awesome hiking guide that perfectly sums up the best Cape Town has to offer. The Karoo National Botanical Gardens is truly unique as is it one of the only botanical desert gardens in the world. The 154 hectares provide the perfect environment for the cultivation and conservation of the precious semi-desert and desert plants. Only 11 hectares of the gardens are cultivated by man and the remaining escapement is left to nature to do her work. There are two hiking trails that wander through the gardens, the Shale trail and Grysbokkie trail. Visitors often return for the annual spring flowering season that lasts from July to September, you can expect to see the beautiful mesembs flowering creating an orange blanket that seems to effortlessly cover the land. You will run into smaller animals and reptiles in this area. Always remember to respect the wildlife and don’t touch them as they could be dangerous. Guided tours are made available but by pre order only, we highly recommend taking the succulent tour as it is both a life skill and super informative. The garden can be visited on your own as long as you stay on the marked trails and avoid disrupting the natural way of things in the wild. The what seems to be endless green lawns make up the majority of this carefully cultivated garden. The green grass is gently shadowed by the indigenous wild olive and karee trees. The Free State National Botanical Gardens spans for 70 hectares lying on the outskirts of Bloemfontein. This garden provides a home for over 400 species of plants that can be found in the Free State, Northern Cape and Lesotho.There are walk ways that lead you up to the rocky valley peaks where you can overlook the entire garden, or take a stroll down to the dam that attracts a wide array of wildlife. Both the flora and fauna are highly protected here and the Free State Gardens are proud homes to over 30 species of mammals and over 100 species of birdlife. Visitors enjoy the gardens during November through to March when everything looks as if it was painted with a magical green marker. Autumn creates a stunning contrast from green to golds and oranges. The KZN National Botanical Garden was established in 1874 in response to the growing demand for tree seedlings in the Natal Midlands. The focus of the Garden is to collect, display and promote the conservation of plants of the eastern grasslands, in particular the genera Clivia, Gerbera, Kniphofia and Watsonia. Flowering all year round, the Garden sees visitors from all over the world with an interest, or rather a new found interest, in indigenous South African flora and fauna. Each area of the garden is themed, creating a magical escape from the urban hustle and bustle. The Garden, which is also home to a children’s play area, is one of only a few SANBI National Botanical Gardens that has braai facilities. A section of the Garden is planted specifically to attract birds which, along with other diverse habitats, make the Garden rich in bird life, with over 151 species recorded. 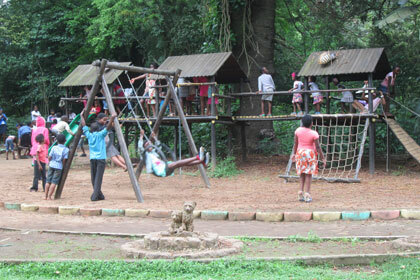 The Garden is also an ideal recreational place for friends and families to relax and create fun–filled memories. Established in 1982 the Walter Sisulu National Botanical Gardens was popular long before it even had a name. The rocky highveld landscape consists of rocky grasslands, savannas and dense bush surrounding the streams. Home to over 600 plant species, this garden allows visitors to experience a variety of biodomes all in one location. The bird species at the Walter Sisulu NBG is something truly spectacular, boasting over 220 bird species including a breeding pair of Verreaux's Eagles who have made their home on the cliffside next to the famous waterfall in the Gardens. The gardens also play home to a variety of reptiles and small mammals like antelope and jackals, who are free to roam the reserve undisturbed. Voted the best place to get back to nature for 9 years running, it’s no wonder the residents of the Gauteng area love these gardens. If wildlife watching is your thing then check out this guide to the best Nature Reserves and Game Parks in South Africa. The Pretoria National Botanical Gardens span for 76 hectares in the Eastern region of the Jacaranda City. A 35 m high quartzite outcrop divides the Garden in two sections, a frosty south facings area and a warmer northern area. These diversities play home to an abundance in variety of flora and fauna. The paved trail runs along the ridge and provides a perfect vantage point for the nature enthusiast or botanist. A massive 50 hectares of the entire garden is devoted to the cultivated area where plant and animal life are carefully monitored and preserved. The garden is home to 50% of the countries tree species truly displaying the massive conservation efforts made here. Not all the plantlife inhabitants are indigenous but the utmost care goes into ensuring the sustainability of our South African species. The gardens itself are always growing and changing and they have introduced different themed gardens giving visitors an experience of multiple biodomes due to the climate in the area. The Garden are also home to the Head Office of the South African National Biodiversity Institute (SANBI) and successfully bridges the gap between scientific research and the recreational environment. The Lowveld Botanical Gardens are divided by two rivers, the Nels River and the Crocodile River. During the drier seasons, the Crocodile River reveals amazing geological formations. Before the two rivers converge they form breathtaking waterfalls that can be viewed from the Nels viewpoints. The clivias blooms greet you as you enter the gardens during their flowering season, filling the air with their sweet scent. The garden features a tropical South African rainforest that is only showed up by the suspension bridge that crosses the crocodile river. The rainforest contains an array of vegetation from the Limpopo province and Coastal Belt. The Garden plays a critical role in conservation of rare and endangered species and played a pivotal role in establishing the cycad gene bank, which is a collection of genes preserved from cycads in South Africa. The preservation and study of these genes helps the SANBI to ensure the sustainability of the species. A unique feature about the garden is that it also boasts one of the largest collections of South African fig trees as well as the baobab tree, which is famous for its unique shape and medicinal properties. Whether you’re a keen botanist or just enjoy the simplicity of the outdoors, these gardens have something beautiful for everyone. They are and always will play a vital role in the sustainability of our environment.